He may have only finished his sophomore season, but St. Helens shortstop Joe Rea has already proven himself to one of the state's best. Rea won a place on the recently released Class 5A all-state teams, earning a spot on the honorable mention team. After playing varsity as a freshman, Rea had a strong sophomore season for a Lions team that went 6-11 in the Northwest Oregon Conference. The St. Helens shortstop hit .448 and led the team with four triples and 15 RBIs. The leadoff batter, he stole 15 bases in conference games. St. Helens coach Jeff Timmons said Rea worked hard after playing varsity baseball as a freshman and was much improved this spring. 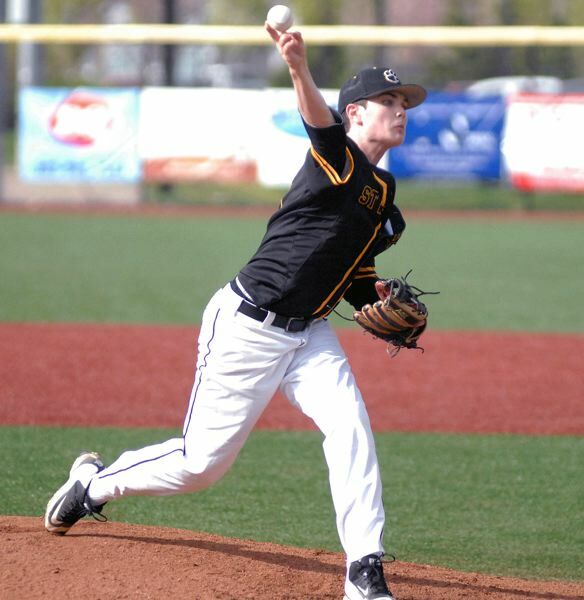 "He worked extremely hard and saw a lot of good pitching last summer on a club team out of Portland," Timmons said after Rea's selection as a first-team all-Northwest Conference pick. "And I think being a sophomore, he was just a little more relaxed." Rea's role figures to expand next season, when he might be one of the Lions' main pitchers. "He's probably going to be one of our aces," Timmons said. "He's only going to get bigger and stronger." Pitchers: Cole Wilkinson, Churchill, senior; Larson Kindreich, Crater, senior; Ben Vavrosky, Wilsonville, senior; Colton Meyer, Silverton, senior; Daniel Naughton, Pendleton, senior. Catchers: Ben Leid, Crescent Valley, junior; Treve Earhart, Dallas, senior. First baseman: Connor Coerper, Hood River Valley, senior. Infielders: Trevor Antonson, Wilsonville, junior; Briley Knight, Crescent Valley, senior; Trae Frodge, Crater, senior; Nick Bastendorff, Crater, senior; Hayden Love, Summit, senior. Outfielders: Nick Bower, Pendleton, senior; Curran Mitzel, Hillsboro, senior; Jacob Dukart, Sandy, senior; Preston Fisher, Thurston, senior. Utility: Kevin Crowell, Lebanon/Central Linn, senior. Designated hitter: Talati Polamalu, Sandy, senior. • Player of the Year — Briley Knight, Crescent Valley, senior. • Pitcher of the Year — Cole Wilkinson, Churchill, senior. • Coach of the Year — Ryan Starwalt, Crescent Valley. Pitchers: Jaret Stewart, Dallas, senior; Andrew Ward, Thurston, senior; Nolan Turin, Sandy, senior; Greyson Losee, Hood River Valley, sophomore; Caden Mathisen, Bend, sophomore. Catchers: Cade Crist, Thurston, sophomore; Wyatt Noland, Hermiston, junior; Colby Bonner, Sandy, senior. First baseman: Trevor Groves, Churchill, senior. Infielders: JD Pinion, Corvallis, senior; Chase Elliott, Thurston, senior; Adam Stevens, Wilsonville, senior; Tyler King, Sandy, senior; Reece Gordon, Bend, junior; Isaac Beaman, Hood River Valley, junior. Utilty: Marshall Davis, Bend, senior. Designated hitter: Dalles Seufalemua, The Dalles, sophomore. Catcher: Cole Frey, Bend, senior. First baseman: Logan Peterson, Summit, senior. Infielders: Joe Rea, St. Helens, sophomore; Cameron Losey, Hillsboro, senior; Caden Lieblien, Hood River Valley, junior. Outfielders: Evan Hockett, Ridgeview, junior; JJ Mears, Hood River Valley, senior. Utility: Trevor Duran, Thurston, senior. Designated hitter: Gage Mills, Crescent Valley, junior.